It is accompanied by Stompas Curve pull out desk and 3 drawer chest offering a practical storage solution as well as a place for them to work and create. Made from durable MDF and oak, this furniture set features smooth curved lines, rounded edges and an attractive white and oak finish, making it a safe and attractive addition to their room. The desk can easily be stored beneath the bed, and pulled out when needed. The chest offers further storage options for clothes and bedding. 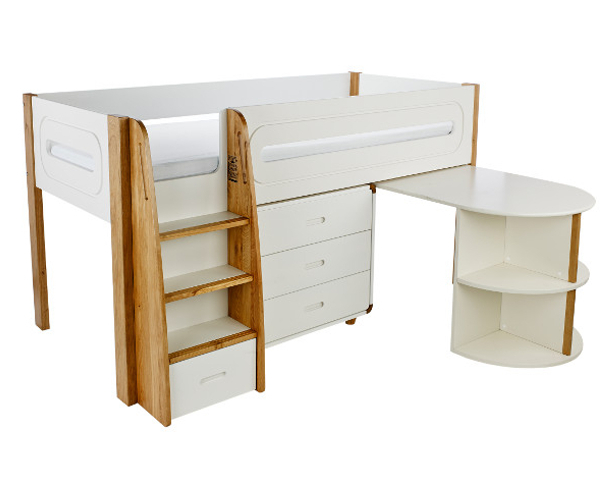 Includes Curve Midsleeper Bed Frame with Pull Out Desk and 3 Drw Chest.